Join Question Bridge artist Bayeté Ross Smith and producer/editor Natasha L Logan for a conversation about using art to build platforms where everyday people can to establish indisputable self-definitions. Question Bridge creates a window for people outside of a particular community to experience the conversations, consciousness, and perspectives of the specific group. This is directly relevant to Black Lives Matter because it creates a means of humanizing Black males, a group so often dehumanized throughout the history of American society. 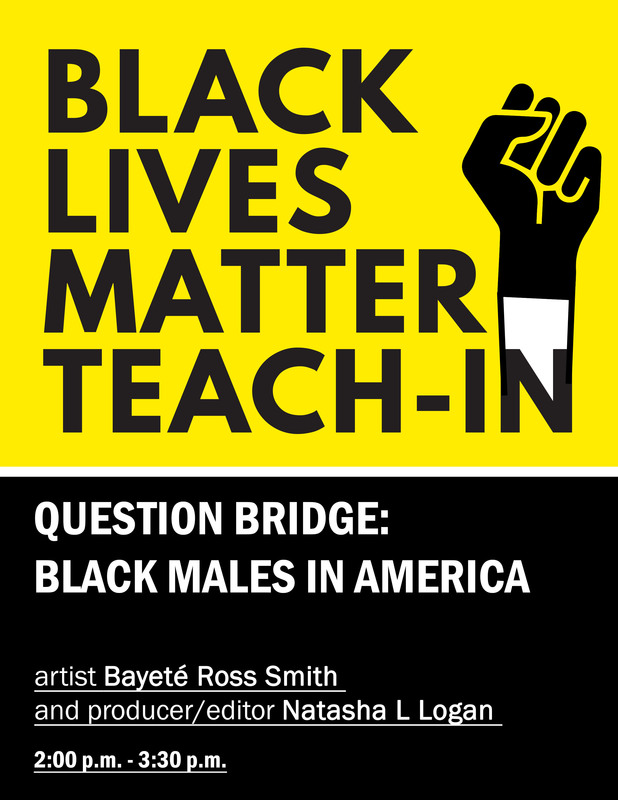 With the new publication, Question Bridge: Black Males in America, a mobile app and interactive website, and a traveling video art installation, Question Bridge continues to be a vehicle that activists, educators, and citizens can use to initiate dialogue and expand understanding in their local community. Question Bridge ultimately serves as a case study on deconstructing identity frame works and false narratives.